Let’s talk about The Paper People. Or maybe I’ll just talk and you do what you want to. And...immediately we’re off on a tangent, because my son gave me a hat for Christmas. Just a cap, and I loved it, but mostly I forget what it says. 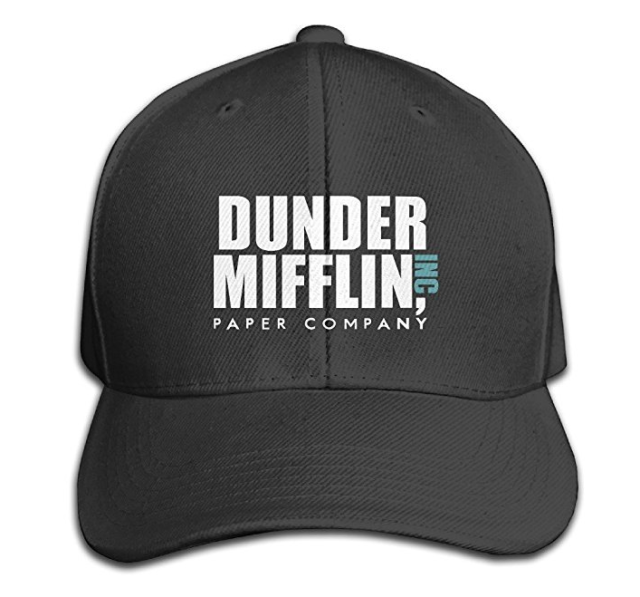 Which is Dunder-Miflin Paper Company, which is the company name in the American version of The Office, which is the greatest show ever, of course. A box boy (are they still called box boys, when they’re teenage girls? The people who bag and carry stuff out to cars) noticed it yesterday and tried to engage me in a conversation about season six. There are a lot of fans. I am one. But I’m not talking about those paper people. I’m talking about people who need stuff on paper. They don’t care to read electronically; they want to hold a piece of dead tree. My wife is a paper person. I know others. When I started a business in 1990, I was surrounded by paper. I produced hundreds of dot-matrix-printed pages myself every day, and then there were these huge census forms and faxes and reference material, all of which wouldn’t exist these days, at least for me. I had to actually call trucks to come and shred this stuff a few times every year. Small wonder I bristle at overuse of paper. But I understand that it’s a taste thing, particularly if we bridge a couple of eras. To some people, a newspaper isn’t a newspaper unless they can hold it and turn the pages (to some people, of course, a newspaper is a trivia question). My wife really needs to print stuff out, even though she’s well aware that she can just save them as PDFs. We joke but I get it. Like books and e-readers. Some people just can’t get there. Anyway, I’m kind of swamped with paper these days, mostly medical stuff. Plenty of it is electronic, which is great, but they still hand out a lot of paper and I’m not the best organizer. And because my wife is the only one who prints stuff, and thus has the only printer(s)—we have many, most of which don’t work—and she can’t seem to keep that printer on the network, I have to go through a mess of work just to print a single page when I actually need to do that. And most of the time I’m not printing, I’m scanning. The other day, I looked at this cardboard box full of visit summaries and drug lists and diagnoses and figured I’d drag the whole thing to her desk and scan the bunch. Her desk is not neat. She is not a neat person. This isn’t an insult, at least not after all of these years. She has her own way of organizing. It is a fairly unusual way. I tend to step on her filing system when I walk through the room. So it occurred to me that I needed my own scanner, but something simple. I don’t need a printer. I don’t want to use one of these tiny ones, or my phone. Just a simple flatbed scanner that just did scanning. Is that too much to ask? Nope. Got one yesterday and it works as advertised, inexpensive, the cost of a dinner. Now I can organize my little self into nirvana. This was a good part of the day. The best part, though, was getting the call from Costco, telling me my new glasses were ready. What the what, you say? Wasn’t that only two days ago? I believe that’s correct, sir. My old glasses hurt. These are lighter and feel great, and the left side Rx has been upgraded so the blurriness is gone. And, once again, Costco glasses are inexpensive. I would have easily paid double online or at Lens Crafters or some place like that. For someone who has worn glasses since adolescence, with a few years of contacts in between, this is important. They’re part of my face. These are rounder, which gives me more real estate but still don’t look like those 1980s huge ones. I will take the Harry Potter jokes gladly. There was an article the other day about how to avoid getting stressed over your sleep tracker, which a lot of us now wear (like the Fitbit and Apple Watch). The point was, if you feel rested and your sleep tracker says you didn’t get optimal REM or whatever, you can ignore it. These things are pretty good at knowing when you went to sleep and when you woke up; the rest is kind of guesswork. I rarely look at mine anyway, but I did today. Because last night after dinner and all the excitement of forcing everyone in this house to take my picture with my new glasses and my fairly new haircut, around 8:30pm, I started to wind down in my own familiar recliner and yup. Woke up at 11, stumbled to bed, slept some more. We have ourselves a pattern. But when I check my Fitbit, what I see are a few nights when I approached 10 hours of sleep, broken up a tiny bit. That’s not some sort of aberration or sign of a disorder, I think. It’s a huge amount of sleep for most of us, but it’s not a marathon. Obviously it was important. I’ll take it. And as we note, these have been productive days. I might have a theory in the works here. Finally, since I’m all rested and full of beans, I got snippy with a couple of people yesterday. I think I was justified in some respects, but in others it was uncalled for. I have more apologies to make today. See? This Lent thing is a piece of cake. Help out when you can. Take care of business. Be kind and sociable. Get plenty of sleep. Understand that you’re going to make mistakes, particularly under stress, and don’t beat yourself up, just apologize. Writing it all out like that, it doesn’t seem all that insightful. I knew this stuff. I just forgot, I think. Maybe Lent, to me, is just about this, about relearning old tricks. About remembering. That’s exactly what Lent is about, by the way. Remembering.